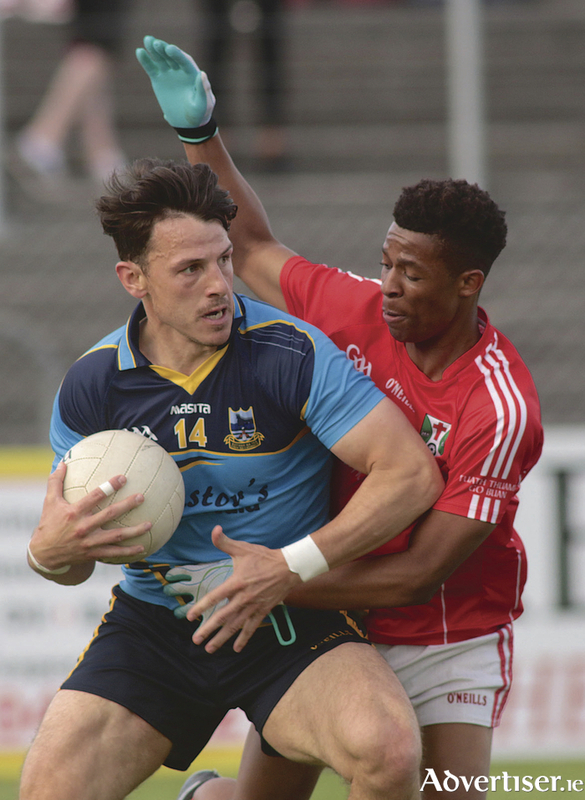 Paul Clancy’s Maigh Cuilinn team competed fiercely for 40 minutes, but they faded away when they needed to kick into another gear to give the county champions a fright. With the aid of a strong wind in the first half, county players David Wynne and Gareth Bradshaw put in strong performances in defence, while Dessie Conneely showed why he was so important for the Galway U21s in their championship campaign. A big plus for Corofin was the return of Justin Burke, making his first championship start in three years. He showed well from the full-forward line, winning more than his fair share of ball. Having been affected by injuries and departures for America, both sides lacked quality with some slow and ponderous play. And even with the breeze, Moycullen opted to play with just Conneely inside for most of the first half. The Connemara men went in with a two-point lead at half-time, but would have been hoping to be more. Maigh Cuilinn were still very much in the game until county star Gary Sice rattled in a fine goal to put the champions 1-9 to 0-8 ahead, and from there they never looked back. The introduction of Michael Farragher after injury was a positive sight for any of the county management team in attendance - his control of the game and range of passing would have really pleased them. Young Colin Brady produced a superb performance, scoring five points from play, while his driving runs caused havoc, and he was an obvious choice as man of the match. Martin Farragher made his first appearance since last year’s county quarter-final due to injury and showed no ill effects by quickly putting the ball into the back of the net. It could be important for Corofin’s prospects if he and Ian Burke can strike up the partnership that has brought so much success to the club over the last number of years. Along with the effective performance of the returned Justin Burke, manager Kevin O’Brien may have a welcome selection headache for his next championship game. Corofin never hit top gear, but they also never looked like losing the tie. They dominated the second half for a 12-point winning margin. In the first game in Salthill on Saturday evening Killanin’s county players made the difference with their strong finish to win the game by 2-10 to 0-11. After a fine first half from Cortoon, in particular Cathal Mulryan who scored four times from play, the north Galway team faded badly in the second half. And allied to the impressive and strong running from county man Johnny Heaney, Killanin cut open the Cortoon defence for their two goals. Cortoon had managed to cut out Killanin’s sweeper in the first half with direct ball over the top into Mulryan, with Paul Varley and all of the forwards giving options which worked very well. And they deservedly led 0-9 to 0-5 at half-time. But Killanin's Cathal Sweeney took control of the defence; Johnny Heaney ruled the roost in the middle of the park; and Patrick Sweeney won all the ball that was directed into him. Two goals in the space of five minutes from Niall Walsh and Enda Kelly gave them a six-point cushion they never looked like losing. In the first of Athenry's double-header on Saturday Caherlistrane produced a good performance to overcome St James by 2-13 to 1-13, with all Caherlistrane scores coming from play. The second game between Tuam Stars and Salthill-Knocknacarra had a frantic finish with Tuam’s Jamie Murphy scoring two injury-time goals to give them a 2-10 to 0-12 win. Salthill's Val Daly will not be happy with the concession of two majors, having held Salthill a 0-10 to 0-0 lead late in the first half and being eight points up in the second. Ja Fallon, however, will be delighted with the “never-say-die” attitude of his charges. In Tuam, Annaghdown added another strong performance to deservedly beat a young and talented Mountbellew team. County players Damian Comer and Eoghan Kerin both had fine performances, with Comer dominating on the edge of the square. In Clonbur a late goal gave Kilconly a 3-9 to 1-13 win over An Cheathru Rua, while Micheal Breathnachs beat Barna by five points (1-10 to 0-8 ), and Monivea-Abbey scored 2-13 to Leitir Mor’s 1-10 on Sunday. City side St Michael's had a 0-15 to 1-9 victory over Killererin, and Milltown, who had been well beaten by Salthill in the first round, were too strong for Caltra, winning by 0-10 to 0-7.